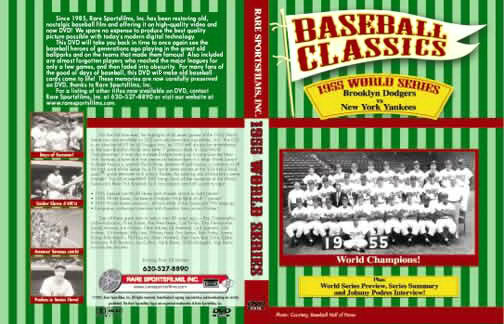 Now for the first time ever, an entire 58-minute DVD is available containing all the highlights of every game of the 1955 World Series, plus a World Series preview of both the National League champion Brooklyn Dodgers and the American League champion New York Yankees, a summary of all the high spots of the series by a TV sports news service of the 1950's and a post-World Series locker room interview with Johnny Podres, the eventual hero of the World Series! This DVD is an absolute MUST for all Dodger fans, as 1955 will always be remembered as the year Brooklyn finally won its only World Championship (after 7 previous tries)! First you'll see a special World Series Preview, a rundown of each player on both teams before the series starts! Shown are some of baseball’s greatest players of the 1950’s including Roy Campanella, Jackie Robinson, Carl Furillo, Gil Hodges, Duke Snider, Don Newcombe, Carl Erskine, Whitey Ford, Bill Skowron, Don Larsen, Phil Rizzuto, Billy Martin, Elston Howard, Hank Bauer, Gil McDougald, Yogi Berra and Mickey Mantle! Following the official 1955 World Series film by Major League Baseball (long version) is a short version or World Series wrap-up, produced by one of the national sports news services of the early 1950's. This contains short highlights of the series and provides all-new footage now available on DVD for the first time ever! Finally you'll see a brief interview with series star Johnny Podres only moments after the final out of the climactic 7th game! Game 1 at Yankee Stadium: Whitey Ford vs Don Newcombe – Jackie Robinson’s steal of home is one of the highlights of this game, although the Yanks win 6-5 in a battle of home runs, two by Joe Collins and one by rookie Elston Howard in his first World Series at bat! Carl Furillo homers for Brooklyn and Duke Snider hits his first of the series, all of which will eventually help establish a new HR record for a 7-game series (17)! Whitey Ford wins with relief help in the 9th from Bob Grim. Game 2 at Yankee Stadium: Tommy Byrne vs Billy Loes – Byrne tosses 5-hit complete-game 4-2 victory and singles in New York’s final run during the Yank’s big 4-run 4th inning! Even though the series now shifts to Brooklyn, it looks like another typical Yank win over the Bums is in the making, with the Yanks firmly in command of the series, two games to none! Game 3 at Ebbets Field: Johnny Podres vs Bob Turley – In their band-box ballpark in Brooklyn, Bums bounce back with an important 8-3 victory, Johnny Podres going all the way and winning with HR help from Campy. A limping Mickey Mantle hits his only home run of the series. Game 4 at Ebbets Field: Carl Erskine vs Don Larsen – Brooklyn’s big bats are coming back to life as Roy Campanella, Gil Hodges and Duke Snider all connect for round trippers. The Dodgers bang out 14 hits and have now scored 16 runs in the last two games off six different New York pitchers including Larsen, who gives up 5 runs in 5 innings in his first World Series game! Gil McDougald homers for the Yankees, but Brooklyn wins, 8-5. Game 5 at Ebbets Field: Roger Craig vs Bob Grim – Duke Snider slams out two more homers to bring his record-tying total to four so far in the series, with at least two more games still to play! – This plus a blast by Sandy Amoros helps Brooklyn roll past the Yanks for the third straight day! It’s a 5-3 victory for rookie Roger Craig, making his first World Series start! Bob Cerv and Yogi Berra hit Yankee homers off Craig and reliever Clem Labine. Game 6 at Yankee Stadium: Whitey Ford vs Carl Spooner – Back at Yankee Stadium Whitey Ford holds Bums to four hits and a single run while striking out eight as Yanks, with their backs to the wall, square the series with a 5-1 victory. New York scores all 5 runs in the first inning. Bill Skowron’s big 3-run blast is his first World Series homer! Game 7 at Yankee Stadium: Johnny Podres vs Tommy Byrne – This is the day Brooklyn will never forget! Sandy Amoro’s famous catch and the great pitching of young Johnny Podres lead the Dodgers to their first World Series title! In a well-pitched game, the Dodgers score single runs in the 4th and 6th innings on a single and sac fly, both by Gil Hodges. The key play of the game occurs in the Yankee 6th. With two on, Berra slices a ball to the opposite field down the LF line. With the runners moving, Amoros streaks across the outfield, reaching one-handed to the foul line to nab Yogi’s bid for a bases-clearing hit that would tie the score! Not only does the catch rob Berra, but an Amoros to Reese to Hodges play doubles McDougald running back to first, and takes all the Yankee steam out of the inning! Podres’ cool pitching and fast ball-change up combo keeps the Yanks off balance the rest of the way, and when Reese throws to Hodges, retiring Elston Howard on a ground ball, Brooklyn’s Bums are at last – World Champions!